A much improved WordPress site. A new client had an older WordPress website. The site needed improvements in SEO, design, and was not mobile responsive. A new graphic design was created for desktop and mobile devices. The site’s old data (blog posts, pages, audio MP3s) were migrated to the new WordPress site. 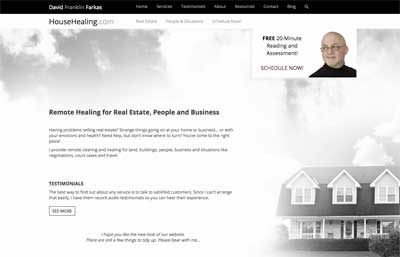 A custom WordPress theme was created for David Farkas of HouseHealing.com based on the new graphic design. This project was completed within 8 weeks. This website was a collaboration with Clean Clear Creative.